Powers/Abilities: Skilled fighter and hunter. History: In the ballad, Guy of Gisborne (called Sir Guy, but actually a yeoman) is a bounty hunter hired to capture or kill Robin. Dressed in entirely in horsehide, Guy encounters Robin in the forest and they begin many trials. After a vicious swordfight, Robin kills Guy. He then chops Guy's head off, mars it, and sticks it on the end of his bow. Robin puts on Guy's distinctive clothing and impersonates the dead bounty hunter in a plan to free the Merry Men from the sheriff. In the comic operas of Reginald de Koven and Harry B. Smith, Guy pretends to be Robin's brother to steal his inheritance. 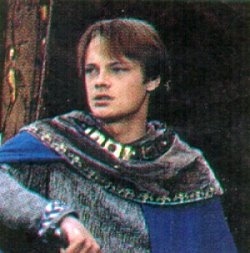 In the Robin of Sherwood TV series, Robin and Guy are also half-brothers. Comments: Thanks to Allen Wright for providing information for this page. Check out his Robin Hood website. Allen notes "Robin and Guy's encounter in the 1938 The Adventures of Robin Hood is arguably the most classic movie swordfight ever. Although Errol Flynn's Robin Hood won the fight on screen, in reality Basil Rathbone (Sir Guy) was the superior fencer."